Sue Bartlett is a nurse working in a school on the remote island of Taborio in Kiribati, a small island nation in the Pacific. Nutrition related diseases and infant mortality are significant health concerns, as is effective and timely treatment given the distance between the islands and the shortage of specialists. For World Health Day 2019, we asked Sue about the healthcare situation in the school and in Kiribati, generally. I am working as a volunteer school nurse on an outer island in Kiribati. 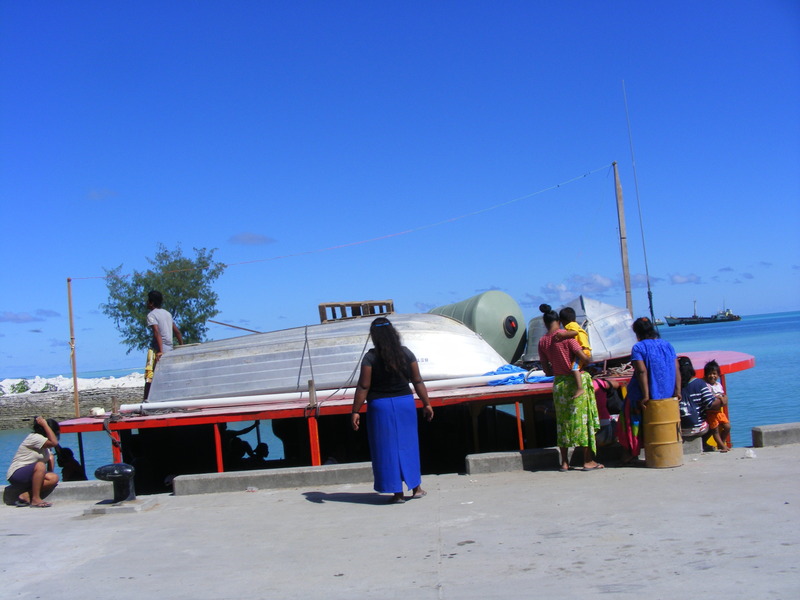 We are 2 hours by local boat from the main island of South Tarawa and there isn’t any air transport here. Boat with supplies arriving at port. Having a background in acute hospital nursing, with very limited Emergency experience, I wasn’t sure how I would manage over here, but I have found the clinic staff on the island to be wonderfully knowledgeable and resourceful. Only too happy to share their knowledge, and improve mine, and to share their medical resources (for example, medications and dressings). In many ways working in the school clinic is similar to caring for my own children with the usual cuts, scrapes, and infections. I have found that the greatest health issue in the school is getting students to understand they need to complete any treatment program they are on. For example, antibiotic therapy or daily dressings, staying out of the lagoon with open sores, and keeping their fingers away from infected sores or eyes to prevent spreading infection. It isn’t helped by the fact that I haven’t mastered the language in order to successfully educate them, although the clinic nurse and the medical assistant try to fill the void when they can. 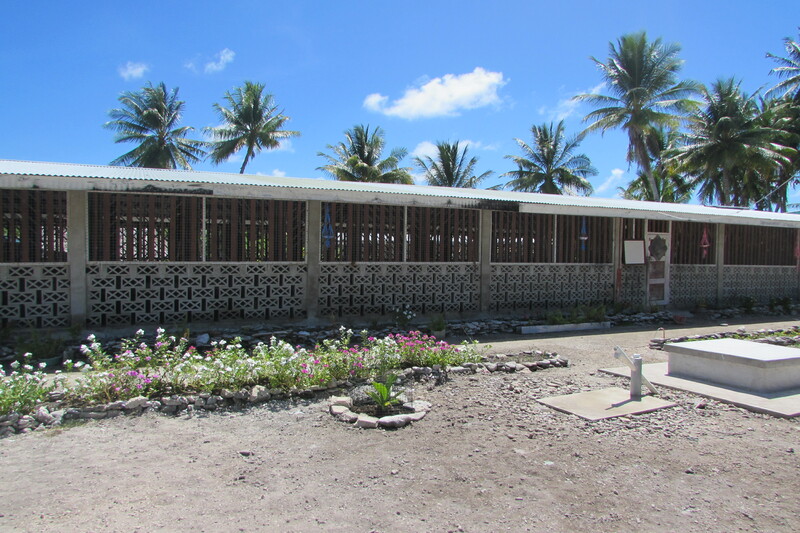 School dormitory building on Taborio, Kiribati. The health system over all in Kiribati is doing its best. There are two hospitals on South Tarawa (the main island) with adequate Outpatient facilities and intermittent specialised clinics, conducted by overseas volunteer specialists. The hospital facilities are basic and overworked. There is an ambulance system on the island of South Tarawa. There are also nursing clinics in some of the villages there, as well as on some of the outer islands, though not all, where patients can get medical help from registered nurses and medical assistants (similar to our nurse practitioners). These clinics offer antibiotics, suturing, dressings, basic dental care and referral to the hospital system. They also arrange emergency treatment and transport when necessary. On the outer islands this transport is usually a boat. I must admit I was pleasantly surprised by the health care available here. The Ministry of Health is doing its best to provide for the basic health care needs of the iKiribati with the limited financial resources that they have, especially as anything medical is expensive, and with everything having to be imported it becomes even more so. More advanced treatments are catered for by volunteers from surrounding more developed nations such as Australia, New Zealand, Taiwan, America and others. To support Sue’s work with staff and students in Taborio, donate to this project here. If you or someone you know is a registered nurse who is passionate about helping remote communities overseas, Palms is currently recruiting a nurse to work in Abaiang, Kiribati, in a similar role to Sue’s. See the position description and apply today. Read more about Kiribati in our report for World Water Day, 2019.